If you are looking for a tattoo, you may want to consider some type of sleeve tattoo. Sleeve tattoos or tattoo sleeves usually consist of multiple tattoo symbols that have a similar theme. 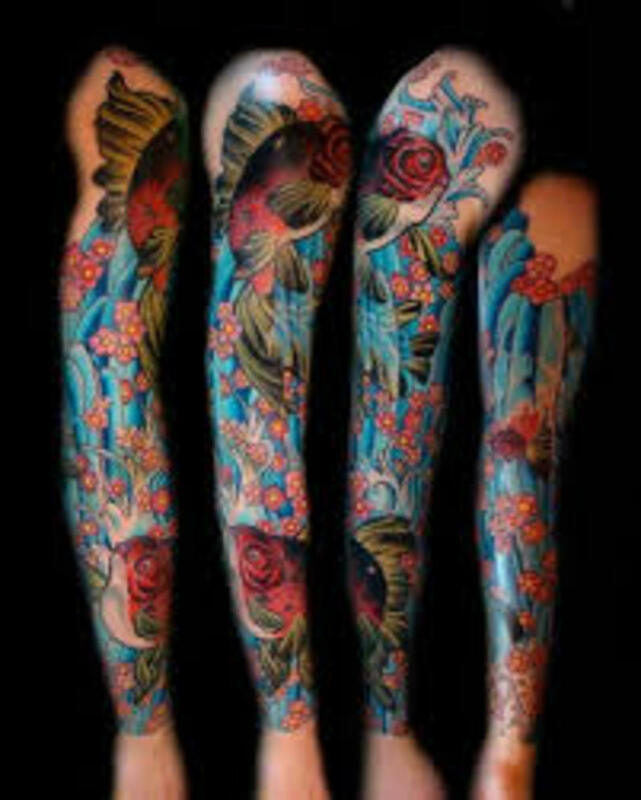 Most sleeve tattoo designs are tattooed on the arms, but the legs can be included. 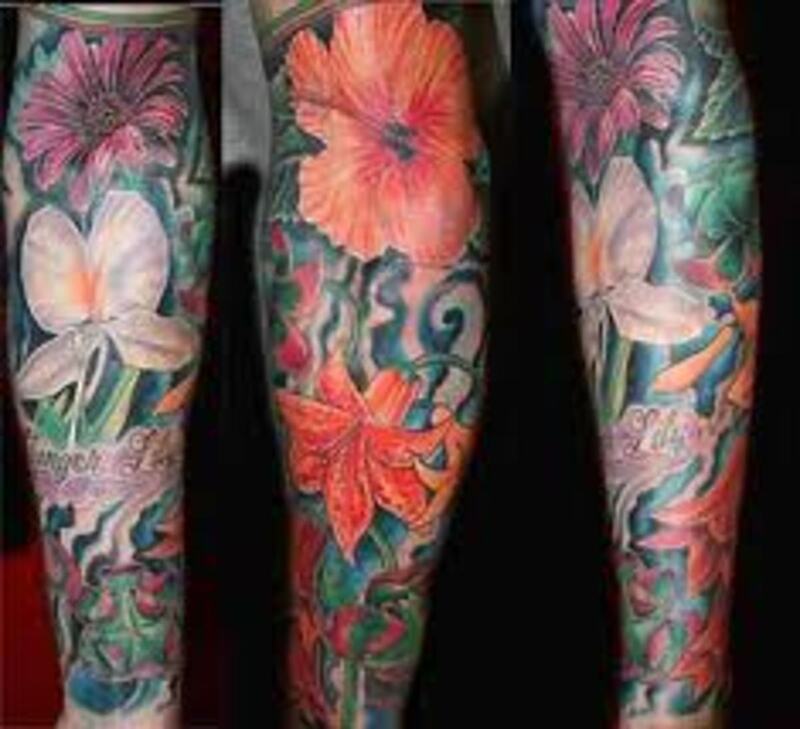 Sleeve tattoos may cover the entire limb or half of the limb. Sleeve tattoo designs can also include just one tattoo symbol. 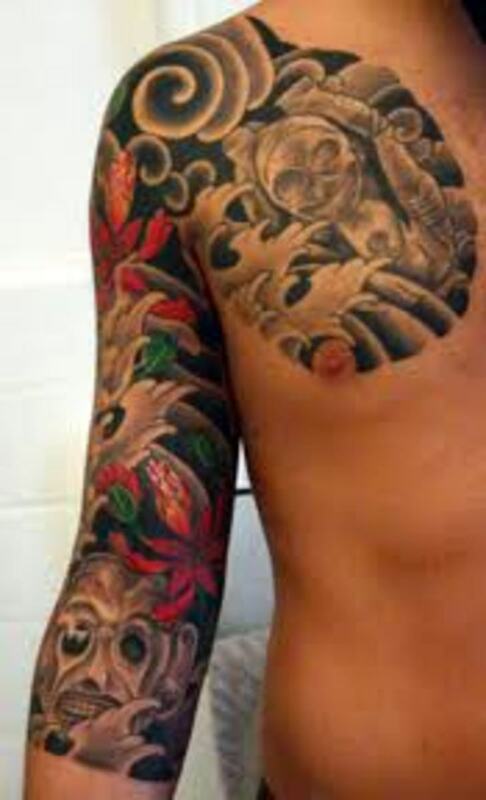 When it comes to sleeve tattoos, there are several themes that may be used. Since both women and men where sleeve tattoos, sleeve tattoo themes can nearly include anything that you wish to portray. In this article, we will discuss sleeve tattoos and half sleeve tattoos. 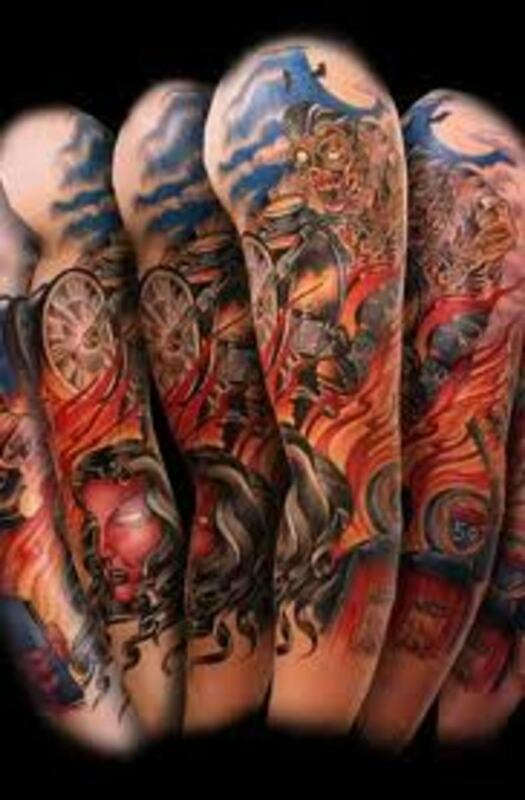 We will also review sleeve tattoo themes and give you a variety of sleeve tattoo themes that you may want to use. 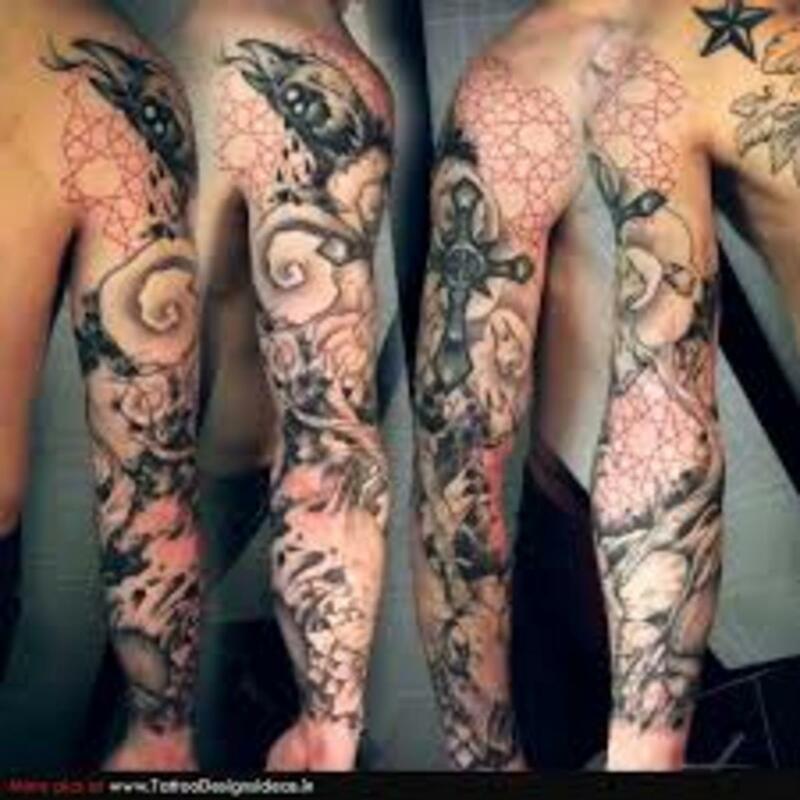 You will also have the chance to view several sleeve tattoo designs pictured below. In the end, we hope that you are able to find ideas and inspiration for your next tattoo design. Below, you will find a list of possible sleeve tattoo themes and the appropriate symbols that may be chosen for the theme. As mentioned above, there are thousands of themes that you could choose from, along with thousands of symbols and elements. 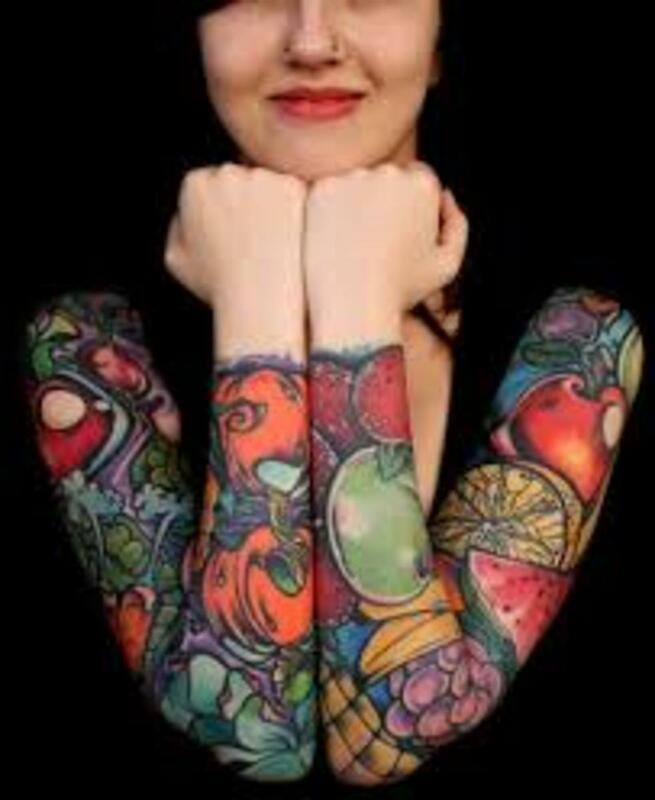 We have came up with a list of popular sleeve tattoo themes that you may want to consider. American Theme- You may want to consider an American theme for your sleeve tattoo. There are several symbols and elements that are appropriate for an American themed tattoo. 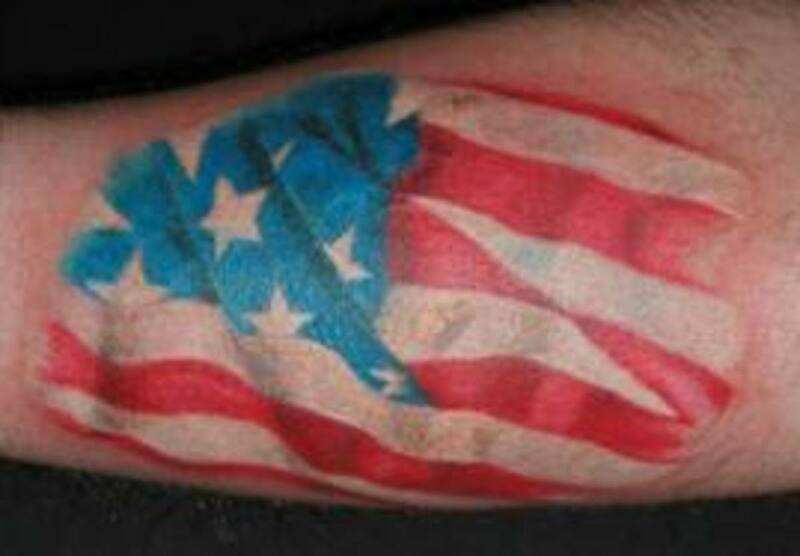 First, the colors of red, white, and blue can be implied into your sleeve tattoo design. You could use the American flag tattoo, bald eagle tattoo, stripes, and stars for your American themed sleeve tattoo design. Anything associated to America could be included. You may wish to include a famous landmark or location also. Celtic Theme- Celtic art is a major art style in tattooing. Celtic themed sleeve tattoos often reflect on Irish heritage and history. There are several different symbols that may be appropriate for a Celtic sleeve tattoo. The Celtic Tree of Life tattoos, clovers, shamrocks, four leaf clovers, rainbows, and leprechauns may be portrayed in this type of sleeve theme. Celtic knotwork, symbols, or mazes may also be included. Celtic cross tattoos could also be designed in your Celtic sleeve design. 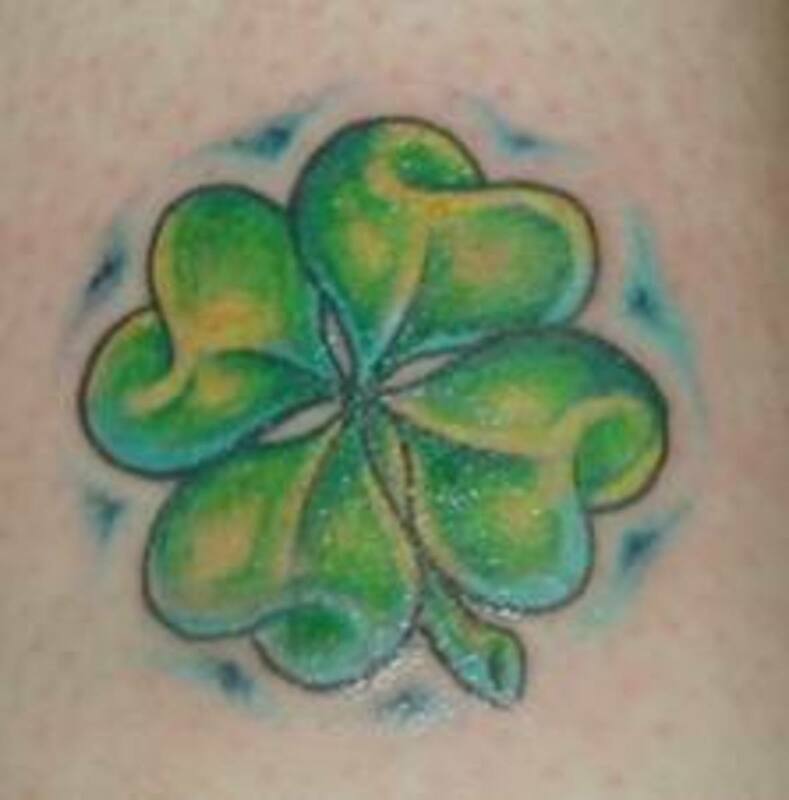 This type of sleeve tattoo design is often chosen by men and women wanting to represent their Irish heritage. Chinese Theme- There are several symbols and characters that represent China and the China culture. 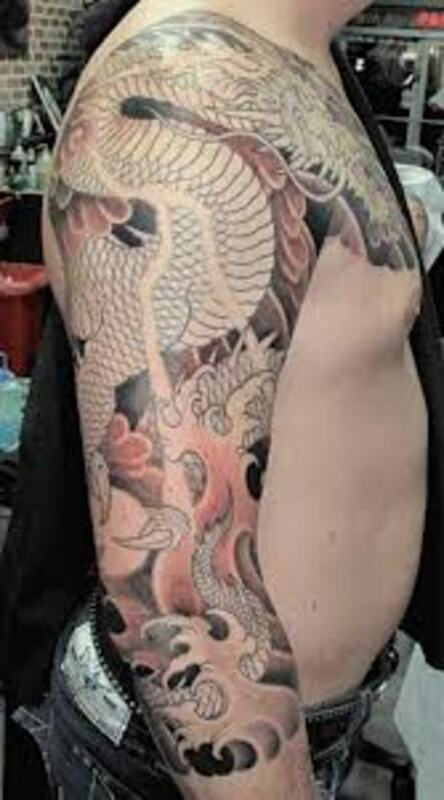 The Chinese theme can include the peony tattoos, Bengal tiger tattoos, Ginkgo tree, cherry blossom tattoos, dragon tattoos, and anything else associated to this tattoo theme. The panda bear and red-crowned crane could also be included in your Chinese sleeve tattoo design. Red and gold colors are appropriate in the Chinese theme. Death Theme- This tattoo sleeve theme represents symbols and elements that are associated with death. This type of theme often includes black and other dark shades. Death theme sleeve tattoo designs could include skulls, demons, coffins, candles, skeletons, bats, or grim reaper tattoo designs. You may want to consider black roses or red roses. Lightning, fire, barbed wire, daggers, and black clouds may also fit in your death themed sleeve tattoo. 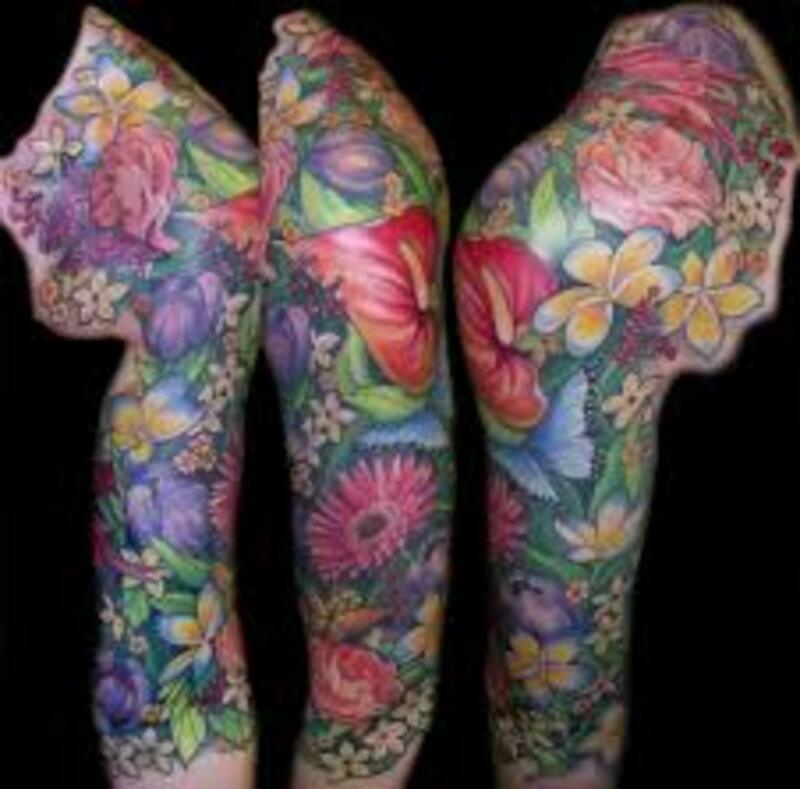 Flower Theme- Flower sleeve tattoos are a popular sleeve tattoo theme among women. Any type of flower could be used with this theme. Rose tattoos, daisies, lilies, hibiscus, daffodils, sunflowers, cherry blossoms, and the lotus are some of the more popular flower tattoos. 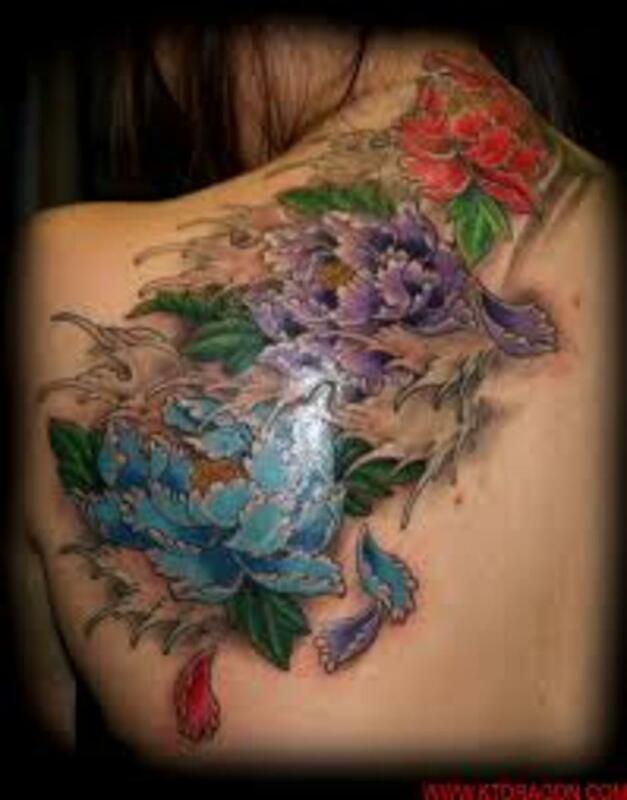 Flower themed sleeve tattoo designs can also include butterflies, ladybugs, swallows, hummingbirds, and dragonflies. Each flower represents something different, just in case you are looking for a meaningful tattoo. 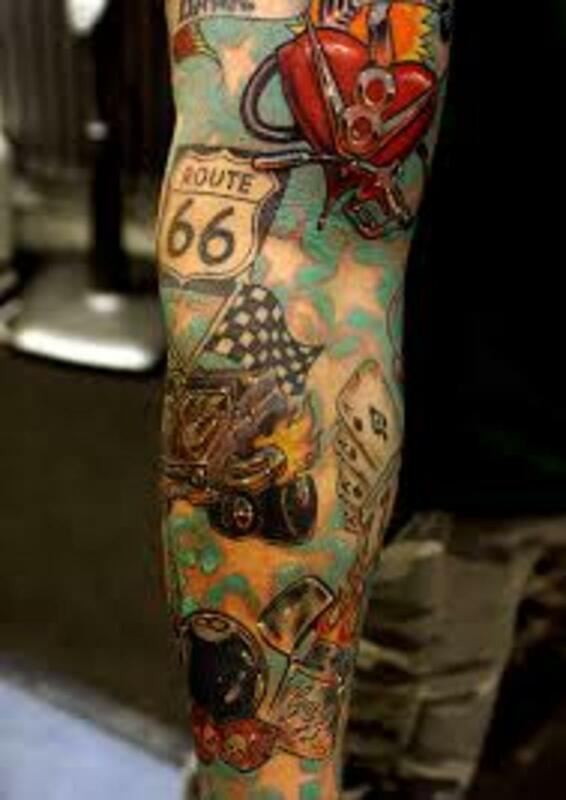 Gambler Theme- The gambler theme or lucky theme is a very popular choice when it comes to themed sleeve tattoo designs. There are several different symbols that represent good luck and good fortune. Appropriate symbols include dice, poker cards, four leaf clovers, horseshoes, poker chips, money, and the number 7. Fire and flames may also be included in the sleeve. 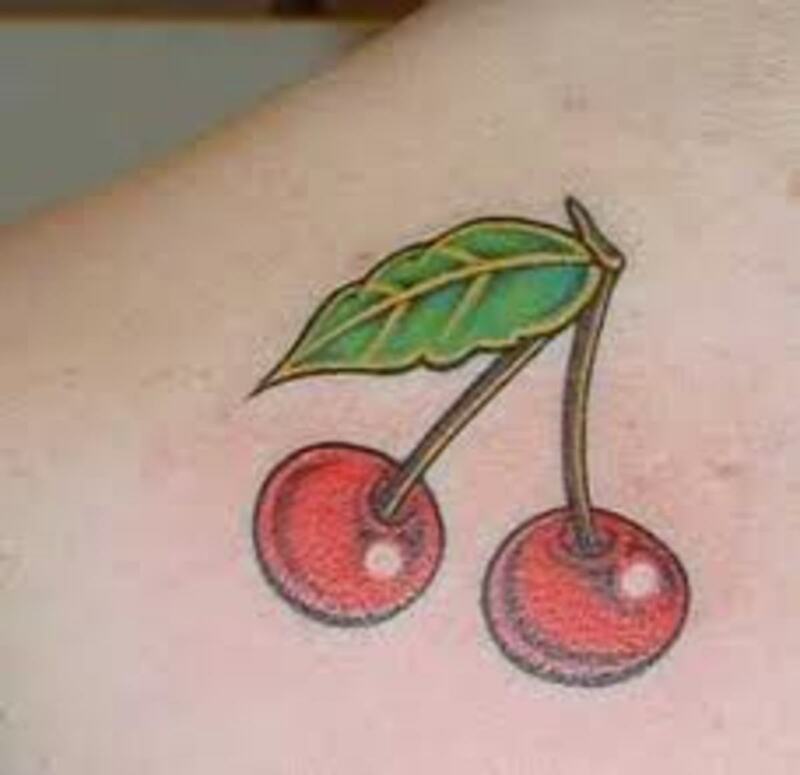 Cherries, ladybugs, and the magic eight ball are also symbols of good luck. 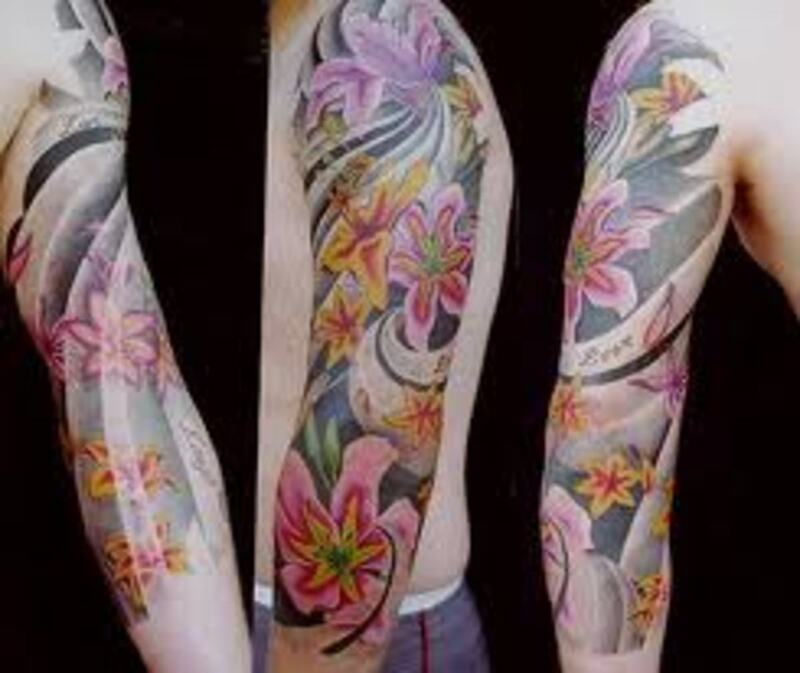 Hawaiian Theme- Hawaiian themed sleeve tattoos can portray many different symbols and elements. Any symbol associated to Hawaii may be considered. Sharks, dolphins, hooks, turtles, and the tiki are just to name a few. The hibiscus tattoo design is always a popular choice. Hawaiian themed tattoos can also portray aspects of the beautiful Hawaiian Islands, such as volcanoes, waterfalls, rainbows, or the beach. Hawaiian sleeve tattoos may also support Hawaiian landmarks. Since Polynesian tattoos influenced Hawaiian tattoos, you may see sleeves that combine these two traditional tattooing styles. Due to this, you may also see stingrays. Japanese Theme- The Japanese theme include symbols and elements associated to the Japanese way of life and culture. Symbols that can be included in the Japanese theme include cherry blossoms, dragons, samurai, oriental fans, and the koi fish. The chrysanthemum may also be included in the Japanese theme. 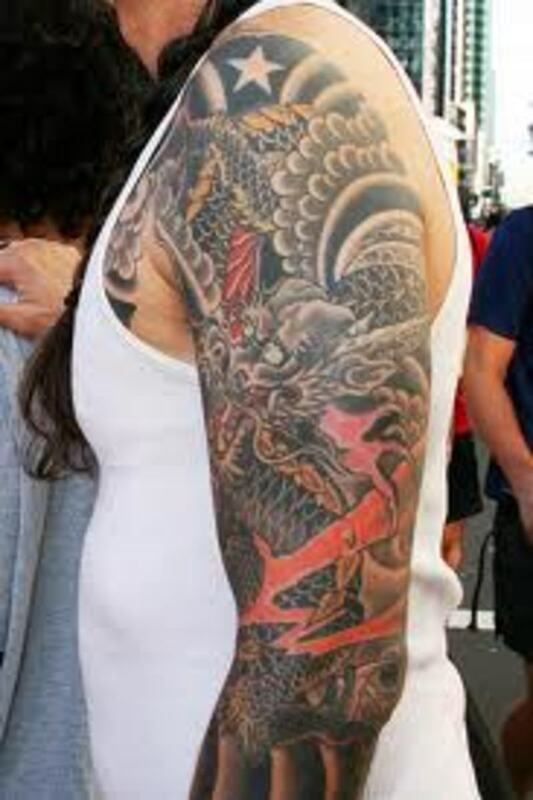 The colors of red and white is also appropriate for your Japanese sleeve tattoo design. Japanese characters are always a popular choice. 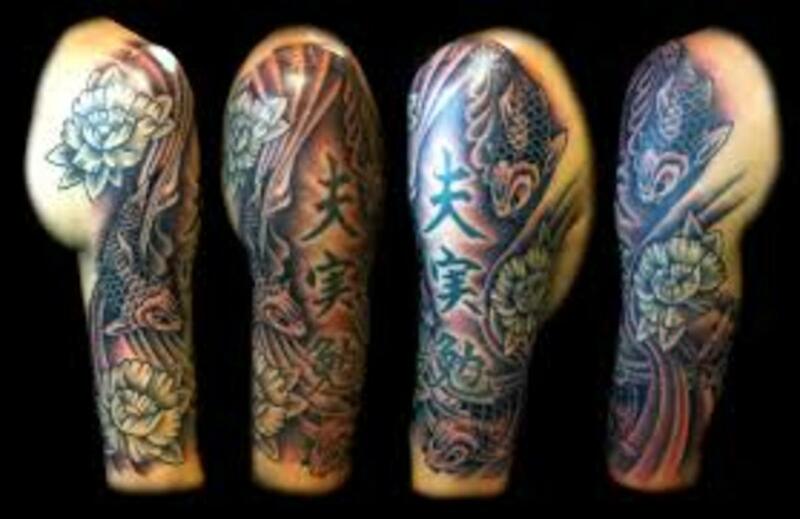 You may also find that Japanese sleeve tattoo designs can also portray ancient temples and the Geisha tattoo. Life Theme- This type of tattoo theme can include any symbol or element that represents life. The tree of life would be the strongest symbol in this theme. There are a lot of symbols that could be appropriate with this theme. The sun, clouds, rain, water, and wind all represent life. The moon and stars can also be included in this tattoo theme. This theme usually is colorful and meaningful to the wearer. Maritime Theme- The maritime theme can include any type of maritime symbol. This is a great idea for a sleeve tattoo design because of the many different symbols and elements that can be included. Such symbols include the nautical star tattoo, compass, ships, ship wheels, anchors, pirates, roses, parrots, and the swallow. 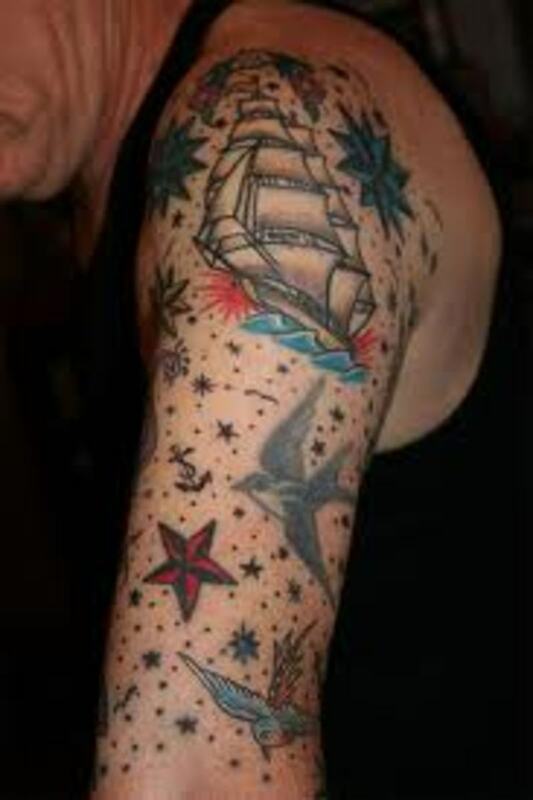 Water is often portrayed within the maritime sleeve tattoo design. Sharks, octopus, mermaids, dolphins, whales, and tuna may be designed within this theme also. Memorial Theme- All of us have lost someone that we loved at one time or another. It could be a parent, sibling, grandparent, or even a child. You may want to keep their memory alive forever within your sleeve tattoo. Memorial sleeve tattoo designs could portray a cross, roses, angels, doves, cherubs, and hearts. 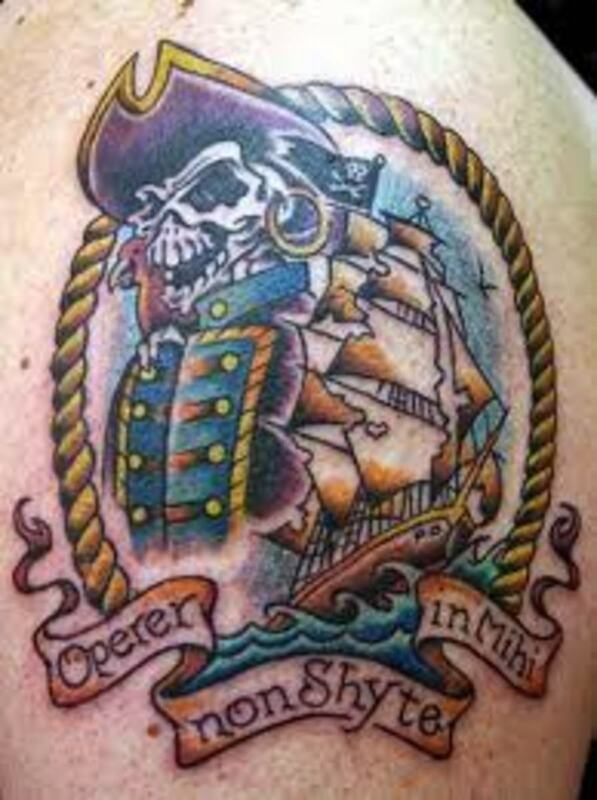 Many tattoo designs portray the names of the deceased. Memorial tattoos are very meaningful, a way to forever remember their loved ones. You could also include symbols that were meaningful to the deceased. 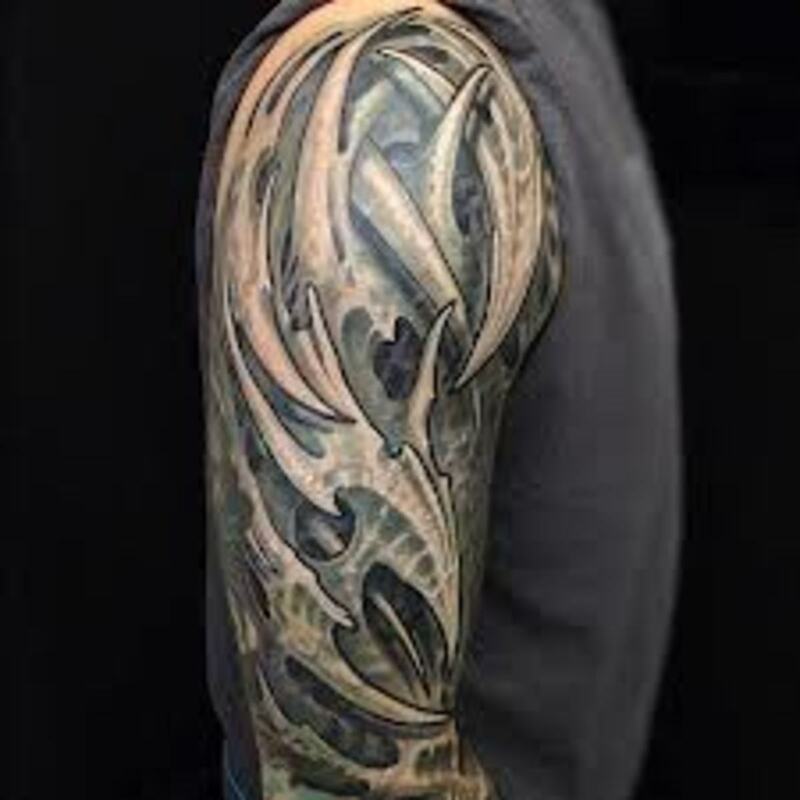 Music Theme- Music themed sleeve tattoos can portray any symbol or element associated to music. Music themed tattoos can include music notes, speakers, microphones, guitars, stars, and piano keys. Music themed tattoos may also include singers and performers. If so, you are likely to see symbols and elements that are associated to the person being portrayed in the tattoo design. Famous music landmarks could be included. 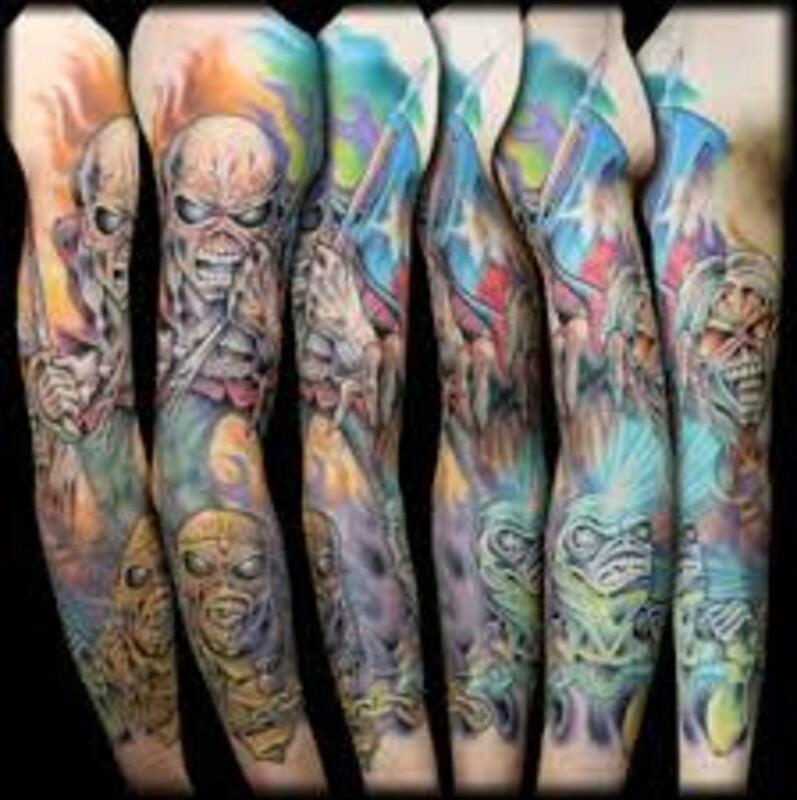 Since there are many genres with music, music themed sleeve tattoo designs can support symbols appropriate for the genre being portrayed. Native American Theme- This type of sleeve tattoo portrays symbols and elements that are appropriate to the Native American theme. This theme can include arrows, dreamcatchers, feathers, beads, stones, and the tee pee. There are also animals that are important to the Native American culture, such as the eagle, horse, wolf, and bison. Your Native American sleeve tattoo can include anything appropriate with the culture. The Native American theme can also include elements such as the sun, clouds, rain, sky, and trees. Spiritual Theme- Spiritual themed tattoos are usually meaningful and portrays symbols that are important to the wearer. 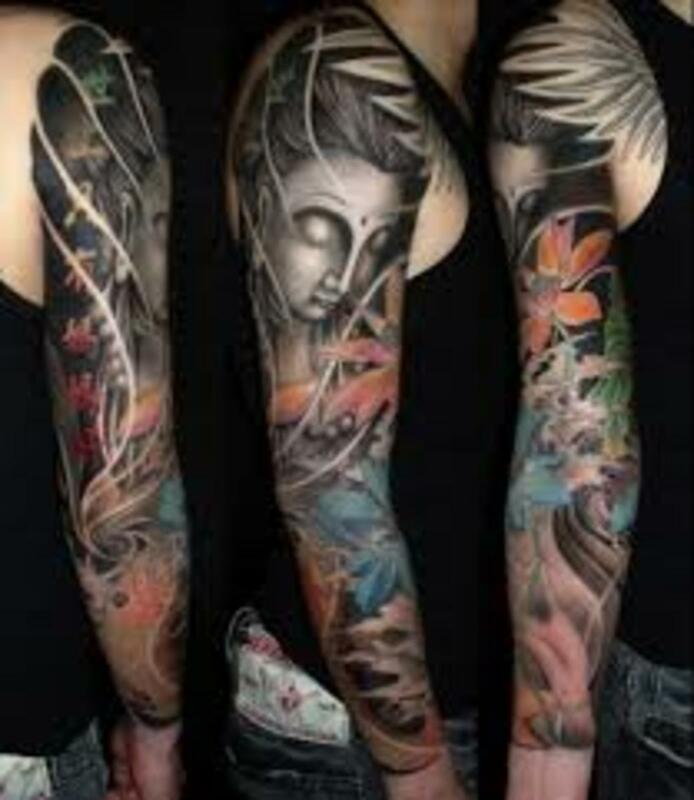 Also known as religious themed tattoos, spiritual themed sleeve tattoos could support a lot of different symbols. Such symbols include crosses, angels, cherubs, praying hands, rosary beads, and religious characters. Bible quotes, clouds, and sunlight may also be portrayed in this type of themed tattoo design. Doves and the color white may also be considered. Tribal Theme- One popular sleeve tattoo theme is tribal art. 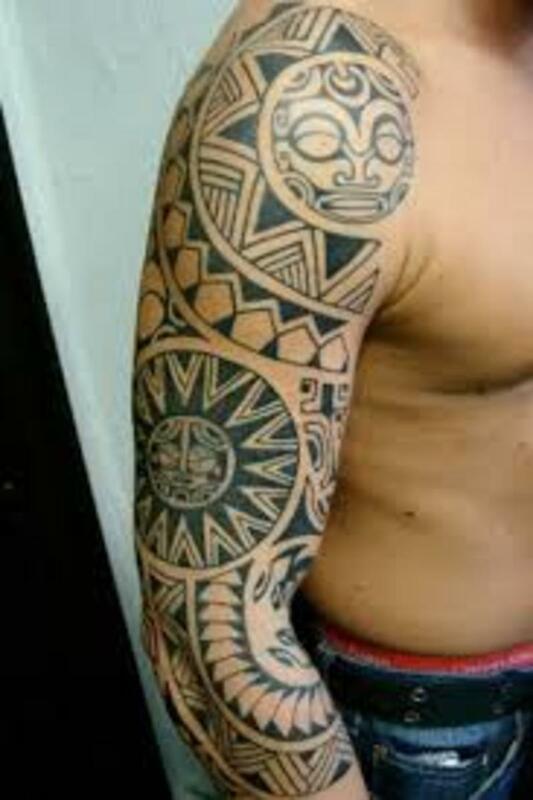 Tribal art sleeve tattoos are very popular among men. With all the different variations and styles available for sleeve tattoo designs, you should be able to find a tribal tattoo designs that you like. 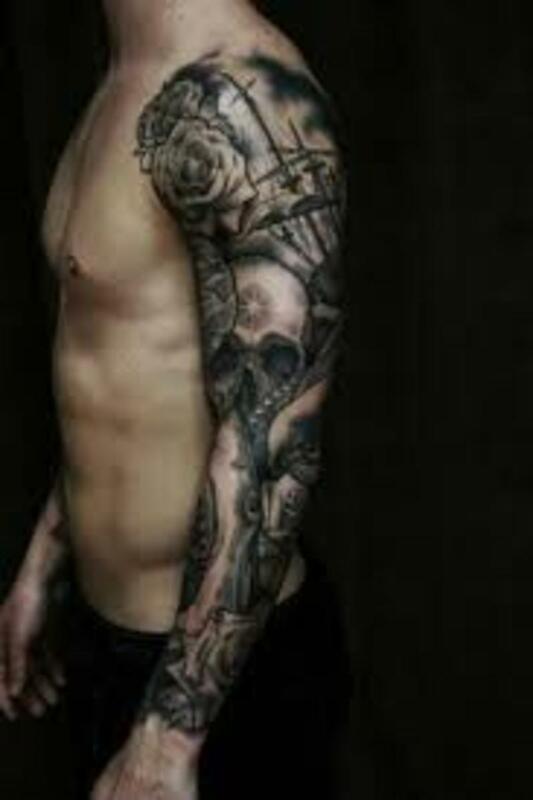 Tribal sleeve tattoos do look much better on men who have a muscle build in their arms or legs. However, this is not to say that someone with a smaller build can't sport such a tattoo design. Warrior Theme- This type of theme can include a variety of different characters. 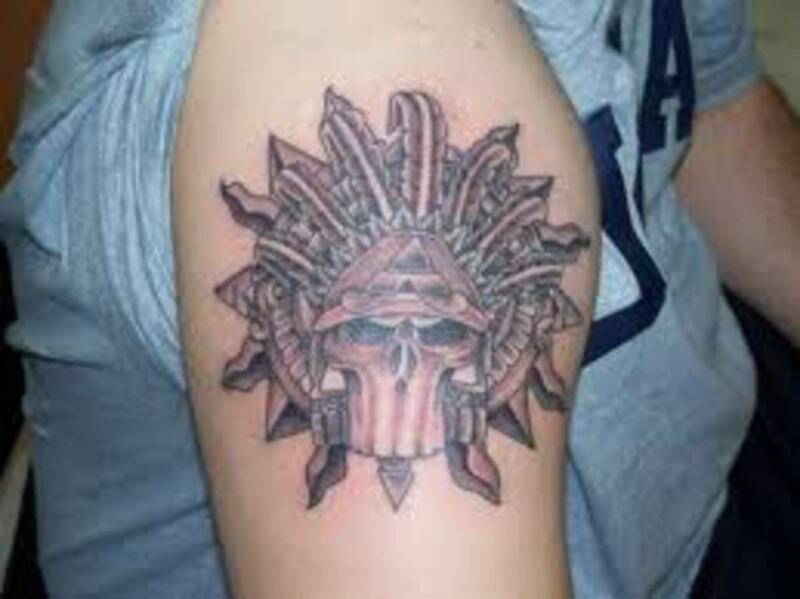 Any type of warrior may be considered for this type of themed tattoo. Samurai tattoos, knights, soldiers, Vikings, Roman soldiers, or any type of warrior could be included. The movie "300" inspired a large portion of warrior tattoos a few years back. This is a great theme to work with because it can include many things. Horses, weapons, flags, swords, daggers, coat of arms, and shields can all be portrayed within the warrior theme. Zodiac Theme- Although this theme is not widely popular as the others, there still is a demand for these themed tattoos. Once you include the Chinese Zodiac, there are a variety of symbols that can be included. Each Zodiac is represented by an animal. Your sleeve tattoo could include anyone of these animals that represent you. Each animal and sign has their own personality, traits, and attributes. In most cases, Zodiac themed tattoos are very meaningful. 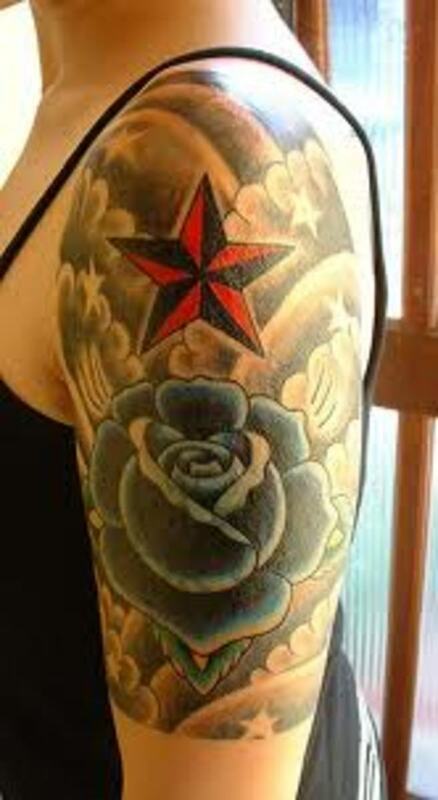 You may also see the sun, moon, and stars designed in Zodiac sleeve tattoo designs. There are many different ways to find ideas and inspiration for a sleeve tattoo or any tattoo in general. One way, find what is important to you. Is there a symbol or element that represents you? For example, we will say that you are a firefighter. 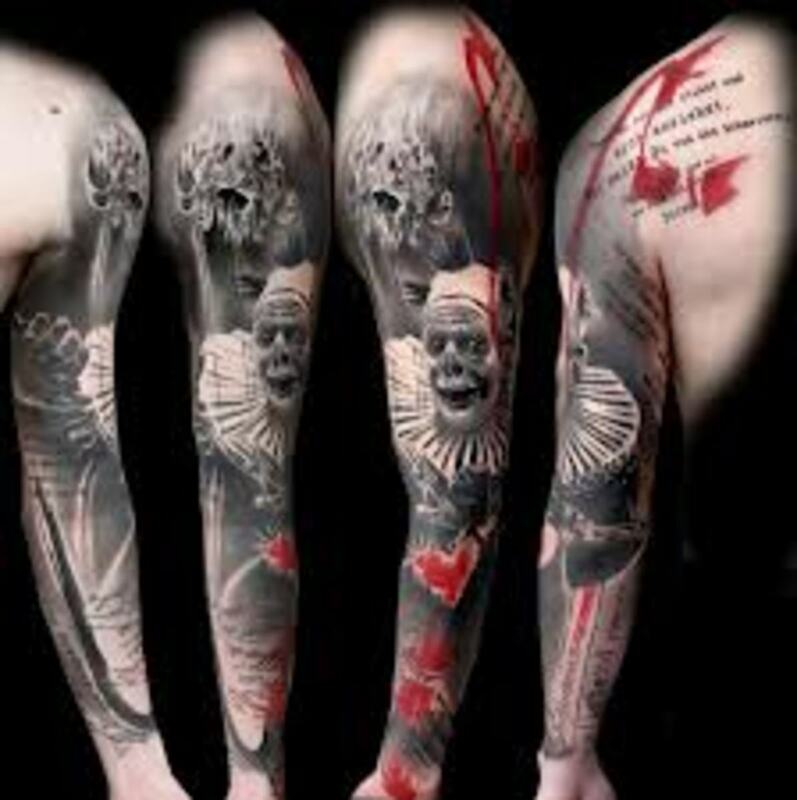 You are looking for a sleeve tattoo design but you don't know what to get. Your suit, hat, helmet, department number, and your fire department symbol would be important to you. These are items and elements that you would include in your sleeve tattoo as they are all associated. Take the symbols, numbers, and elements that are meaningful to you and apply them to your sleeve tattoo design. Your heritage, pride, and family is another great idea for a sleeve tattoo. Where were you born? Are there symbols that represent your name or your family's name? If you are a coal miner, you could apply symbols that represent this. Never be ashamed of where you came from and who you are today. 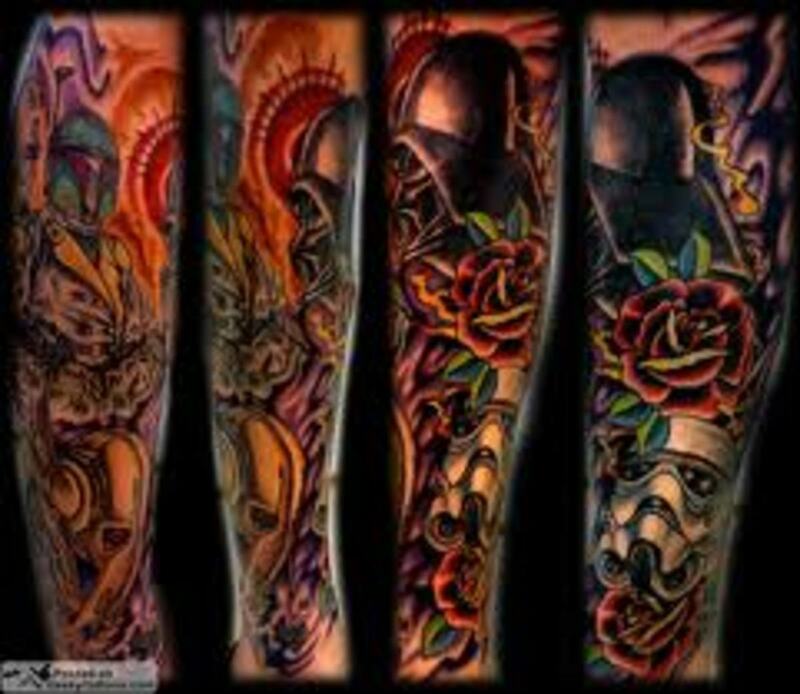 A meaningful sleeve tattoo will make you feel much better then choosing a sleeve tattoo design that has no overall meaning. If your not looking for a meaningful tattoo, make sure you choose one that you won't regret later down the road. If you have served your country or you are currently serving, you may want to consider a sleeve tattoo design that portrays this. The navy, army, marines, national guard, and anyone else all have symbols and elements that represent their outfit. Each outfit has specific colors, numbers, and symbols. Each one of these can be applied and portrayed in your sleeve tattoo design. You can also include aspects of the American theme in your tattoo design as well. If your not from America, you can still portray your country's symbols and elements. Every country has symbols that represent their country. Another idea that you may want to consider is having your immediate family portrayed within your sleeve tattoo design. This can be done in many different ways. This could include your partner and children. You may want to consider others in your family as well. If you are wanting to get a sleeve tattoo that represents your children, you may consider handprints or footprints. Building blocks, toys, hearts, cherubs, stars, clouds, and the moon could be used. Some of you may choose to get their names tattooed. Truth be told, any symbol or element could be used. Some may choose to add a favorite toy or a favorite character. Ideas for your sleeve tattoo can come from anywhere. We always suggest that you consider meaningful symbols because this would be the type of tattoo that you would wear for life. However, the choice is yours. 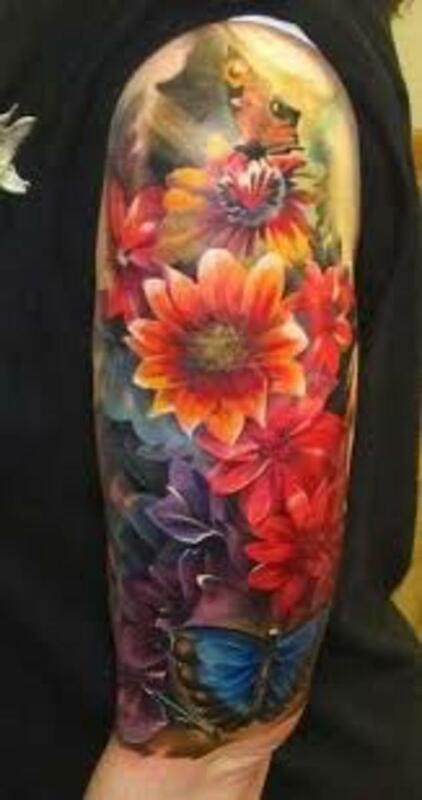 Animals, cartoons, flowers, cultures, and history can all be considered when looking for a sleeve tattoo. You may want to have a historical event portrayed in your sleeve tattoo. There may be a certain animal that symbolizes your characteristics. If your still not sure, be sure to follow the links below. Here, you will be able to browse hundreds of tattoo symbols, meanings, designs, and ideas. As always, thanks for your visit. There are a few things to remember before you get your sleeve tattoo or any tattoo. Please make sure that you take the time to research your tattoo. Make sure that you completely understand what your tattoo represents and stands for. You don't want to get inked and find out later that your tattoo represents something different from what you first thought. Don't rush to get inked! Men and women that get tattooed on an impulse usually regret their tattoo later on down the road. Make sure you are getting what you want. You don't want to have to go through the process of laser removal and cover ups. It will cost you time and valuable money. Make sure you make the right choice the first time around. If you are not sure, give it a little more time until you have no question about your tattoo design. Sleeve tattoo designs are certainly an eye catcher when done correctly. Sleeve tattoos take up a decent amount of space compared to other tattoos. You want to make sure that you go to a tattoo artist that you know and trust. If you don't know where your going to, make sure you research the artist in your area. Read reviews and take the time to visit their shop. Ask to see their prior work as this will give you a general idea of what they are capable. I always suggest to go to a licensed tattoo artist. You can do as you wish. If it was up to me, I wouldn't take the chance because you just never know what your getting into. Research your tattoo symbols, tattoo designs, and your tattoo artist. It is well worth the time. I imagine these are quite expensive to get. I don't suppose you can get these done in pieces so you don't have to spend all the money at once? Voting this Up and Beautiful. Hi my friend great photos of full sleeve tattoos, loved them all .